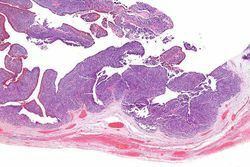 A new approach to pancreatic cancer screening may help doctors detect the disease in people at high risk before it reaches more advanced and difficult-to treat stages. A team led by Van Andel Research Institute (VARI) scientists has developed a new, simple blood test that, when combined with an existing test, detects nearly 70 percent of pancreatic cancers with a less than 5 percent false-positive rate. The results of the blinded study were published in Clinical Cancer Research, a journal of the American Association for Cancer Research. Pancreatic cancer is difficult to diagnose because it often doesn't have obvious early symptoms. By the time the disease is found, it typically is quite advanced, complicating treatment and leading to poorer outcomes. Only 8.5 percent of people with pancreatic cancer survive past five years, a figure that has risen just slightly since the early 1990s. "Pancreatic cancer is an aggressive disease made even more devastating by its tendency to spread before detection, which is a serious roadblock to successful medical treatment," said Brian Haab, Ph.D., a VARI professor and the study's senior author. "We hope that our new test, when used in conjunction with the currently available test, will help doctors catch and treat pancreatic cancer in high-risk individuals before the disease has spread." Both tests detect and measure levels of sugars produced by pancreatic cancer cells that subsequently escape into the blood stream. The sugar measured by the new test -- sTRA -- is produced by a different subset of pancreatic cancers than CA-19-9, the sugar measured by the existing test. When used together, the tests cast a broader net and detect subtypes of pancreatic cancer that may have been missed by using one of the two tests on its own. The CA-19-9 test was developed almost 40 years ago and detects only about 40 percent of pancreatic cancers. It currently is used to confirm diagnosis of pancreatic cancer or track disease progression rather than screen for the disease. The improved detection rate offered by the combined use of the sTRA and CA-19-9 tests makes this approach a viable option for screening and early intervention, particularly in people who have a higher risk for developing the disease. This includes people who have a family history of pancreatic cancer, who have had pancreatic cysts or chronic pancreatitis, or who were diagnosed with type 2 diabetes later in life. Emerging evidence has suggested that sudden onset of diabetes after age 50 could be an early symptom of some pancreatic cancers. Currently, life-long diabetes is not considered to be a risk factor for or indicator of pancreatic cancer. "We believe using these tests in a complementary fashion will help physicians detect pancreatic cancers much sooner in the disease process, which significantly improves a patient's chance for survival," Haab said. "Right now, there are few options for people suspected to have pancreatic cancer. This combined blood test could be a simple, cost-effective way to detect disease early enough to improve patient outcomes." Haab and his collaborators plan to partner with clinical laboratories to gain additional real-world validation for their method. If successful as expected, they envision the test becoming widely available as a screening tool for high-risk individuals.